As the current president of IGGPRA it is with deep regret we announce the death of Richard Sauret. He died in a car accident on Saturday, September 30th at 10:30 pm. Richard was instrumental in the development of IGGPRA, was President of IGGPRA for many years and will be greatly missed. The time he gave to the grape growers of the Paso area was truly amazing. I can not tell you how many times I saw him at events for grape growers in the Paso area acting as a volunteer and in general helping out. I was truly impressed. He will be missed by lots of people. Congratulations to IGGPRA President Lowell Zelinski for making the cover of November 2016’s American Vineyard magazine! Free Seminar Sponsored by The California Sustainable Wine Growing Alliance, USDA, and The Paso Robles Wine Alliance. 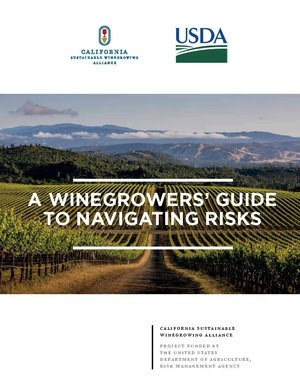 Learn how sustainable winegrowing practices can help to mitigate risk in the vineyard, winery and marketplace. Topics include drought mitigation, water conservation/quality, soil and air quality, pest management, employees, energy efficiency, severe weather and natural disaster risks, insurance and business planning and more. Have reached the third season after grafting for all varieties. Many varieties of grapes are listed for each county. You must insure all your acreage of a particular variety in a county at the same coverage level. However, one variety can be insured and not another. For example, you could insure all your Chardonnay and none of your Merlot vineyards. Counties Available: Grapes are insurable in Alameda, Amador, Calaveras, Colusa, Contra Costa, El Dorado, Fresno, Glenn, Kern, Kings, Lake, Madera, Marin, Mendocino, Merced, Monterey, Napa, Nevada, Riverside, Sacramento, San Benito, San Joaquin, San Luis Obispo, Santa Barbara, Santa Clara, Santa Cruz, Solano, Sonoma, Stanislaus, Tulare, and Yolo counties. Grapes in other counties may be insurable by written agreement if specific criteria are met. Contact a crop insurance agent for more details. To insure the crop you plan to harvest this year, you must apply for coverage with a crop insurance agent before January 31. Insurance coverage begins in February for vineyards that haven’t been insured before and ends the earlier of the date harvest ends or November 10. The price used to calculate your premium and Indemnity. Price elections vary by variety and County. Contact a crop insurance agent for current information. Coverage levels range from 50 to 85 percent of your approved yield. Crop insurance premiums are subsidized as shown in the following table. For example, if you choose the 65-percent coverage level, your premium share would be 41 percent of the base premium. Catastrophic Risk Protection (CAT) coverage is fixed at 50 percent of your approved yield and 55 percent of the price election. CAT is 100 percent subsidized with no premium cost to you. There is, however, an administrative fee of $300 per crop per county, regardless of the acreage. Assume 65-percent coverage, 100 percent price election of $550 per ton, an average yield of 6 tons per acre, Chardonnay variety in San Joaquin county, and 100 percent share. The proposed improvements will help ensure electricity continues to be safely and reliably delivered to nearly 47,000 local customers by helping the electric grid accommodate recent economic growth and protecting against potential power outages. To learn more about PG&E’s proposed upgrades, please visit pge.com/pasoroblesareapc. For questions about NEET West’s proposed substation, please contact estrellaproject@nexteraenergy.com or 1-805-788-4435. The companies will be hosting open houses on January 11 and 12 in Paso Robles to discuss the details of the project, including potential routes and substation locations, answer questions and gather your input. Learn more by clicking here for the interactive map.